This region is the southern heart of the Wood Elves' great forest, and home to more of the gigantic graht-oaks than any other part of Valenwood. 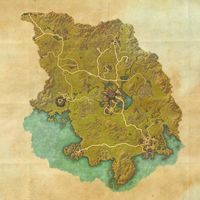 Its capital, now also the capital of the entire Aldmeri Dominion, is Elden Root. 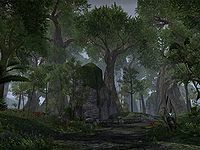 Grahtwood is a large region deep in the jungles of Valenwood, and the location of the Aldmeri Dominion's capital, Elden Root. An area in Grahtwood was devastated by Molag Bal long ago, and it remains there to this day. The Aquifer — The Imperial sewer system of the port of Haven. Ancient Stones, Ancient Words: Recover fragments of an ancient Ayleidoon tablet. Blood Hunt: Clear out the vampires in Goldfolly. A Chief Concern: Deal with the leader of the bandits attacking Barkbite. Enemies at the Gate: Help the Barkbite Wood Orcs with their "curse" and bandit problems. The Enemy Within: Find the culprit behind the Barkbite "curse". Flipping the Coin: Join a group of thieves and steal a legendary treasure. The Innkeeper's Daughter: Help an innkeeper find his kidnapped daughter. Light in the Darkness: Help an old scholar research an Ayleid well. A Lucrative Scheme: Expose the schemes of a Tarlain bandit. The Wakening Dark: Rid Gil-Var-Delle of the God of Schemes' influence. The Wounded Wood: Help heal the scarred ruins of Gil-Var-Delle. This page was last modified on 30 October 2018, at 17:44.